Looking for an established South Carolina sign company that serves Charlotte, NC and beyond? Our family has been selling, manufacturing, repairing and maintaining signs in both North Carolina and South Carolina since Julian Baker Sr. went into the sign business in 1945. After World War II, he started hand lettering signs on store front windows. As the business progressed, he became more interested in neon and fluorescent illuminated signs. Mr. Baker became an industry leader and innovator of wholesale custom Formed Sign Faces. He was producing signs for companies such as Family Dollar Stores, Esso, Cedric’s Fish and Chips, Springs Industries and many more. In the late 70’s his company grew at a fast pace and was producing signs throughout the Southeast. 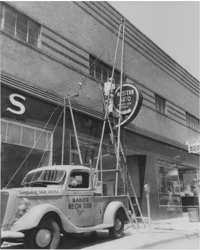 Proceeding his retirement, Baker’s three sons took over the business and had a lot of success and growth handling national accounts and focusing on the latest technologies and manufacturing techniques in the sign industry. In 2005 Rapid Signs, LLC was formed. Our goal is to be the most efficient producer in our region. We are equipped to keep up with the fast-paced growth and economic development around the bustling banking and corporate centers of Charlotte, NC and Columbia, SC. We continue to come up with new ways to provide quick turnarounds without compromising the quality and integrity of our products and service. Still focused on the most innovative products and fabrication processes, we maintain relationships with a variety of successful industry leaders. We assure our customers that their sign will be manufactured and delivered to meet the most durable, cost effective and up-to-date industry standards. Rapid Signs, LLC is a South Carolina sign company that serves all of South Carolina and the Charlotte NC region. Our customers rely on us to evaluate their project and determine the best solution to suit their needs. Whether we are designing a wayfinding program for your facility, or a main identity sign, or brand graphics to communicate your identity, we will use our expertise and knowledge to make sure your signs fit your budget and criteria. We have built a reputation as being one of South Carolina’s most customer-focused and fast sign companies. See what our customers are saying about us. For decades we have been a trusted resource for branded architectural signage and advertising banners. We have access to a variety of materials and resources and we will design solution to work with your budget and other criteria. Rely on us to offer you the best solution for your individual needs. Whether you need one sign or many signs as part of a way finding or branded environment project, our team of experts are available to consult and advise. We can suggest the best options for your budget, or offer a design consultation showing one or more custom designed options for your project. You can rely on our expertise and industry knowledge to point you in the right direction. We provide large scale printed graphics for interior and exterior applications, and vehicle wraps. Advertise your business on your vehicle, or call us to apply fleet graphics to your company’s trucks. We can provide design services or work with your graphic designer or marketing department to generate a look for your vehicles that communicates your brand in a consistent and highly visible manner. Looking for a sign company in South Carolina that can provide an array of graphics and signage products? Call Rapid Signs, LLC. Located in Lancaster SC, we serve South Carolina as well as Charlotte NC and beyond.